With Asana’s Wufoo integration, you can create custom web forms to gather requests, bug reports, applicant information, and more - and feed it directly into an Asana projectproject Projects are lists of tasks. Read more to take action. 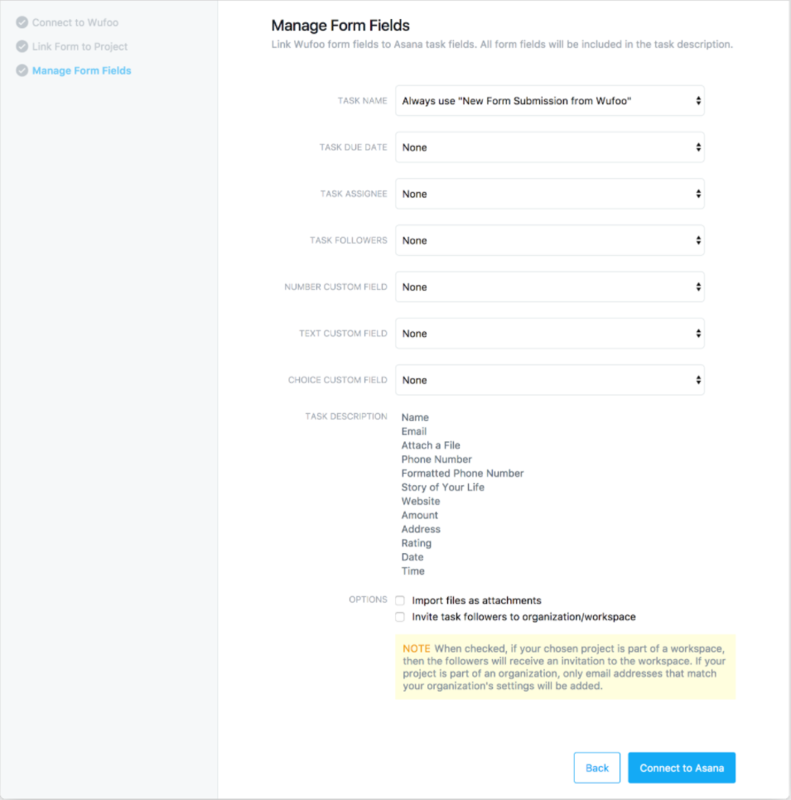 Create your own forms that will appear in Asana tasks. It’s important to note that this integration currently only supports single-page forms. Multi-page forms can sometimes result in data being cut off due to limitations with the API. Authorize the integration to connect with your Asana. 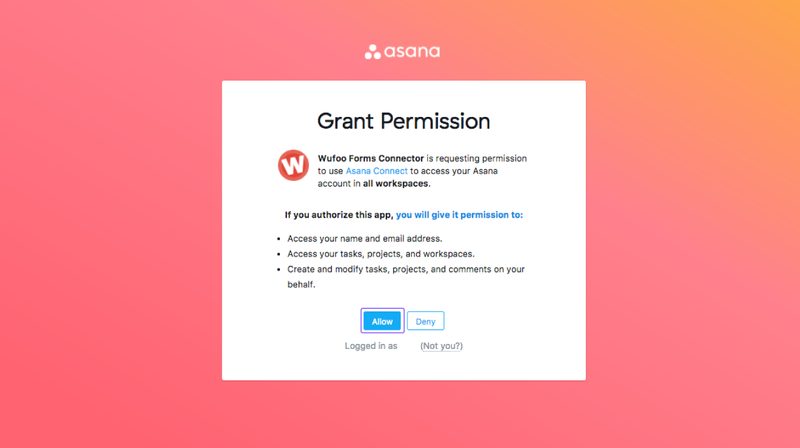 This will prompt you to log in to Asana, and grant the integration permissions needed to connect with Asana. Allow the Wufoo Forms to access your Asana account. You will automatically be redirected to the integration. 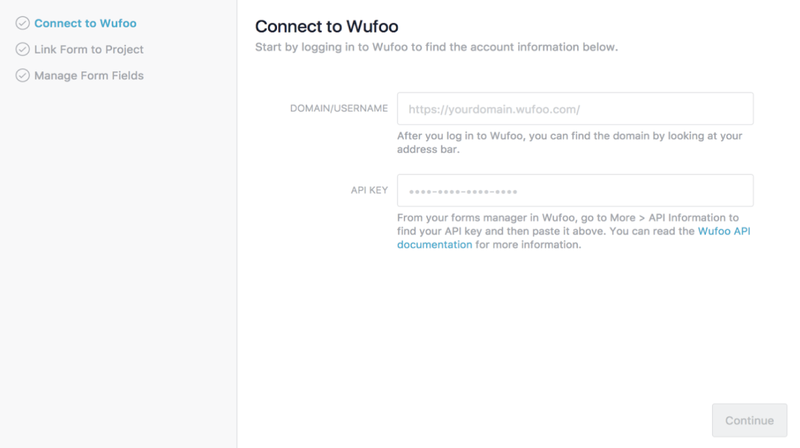 You will need to log in to your Wufoo account separately using your Wufoo domain or username, and navigate to your form manager. This can be found in the URL after you log in. 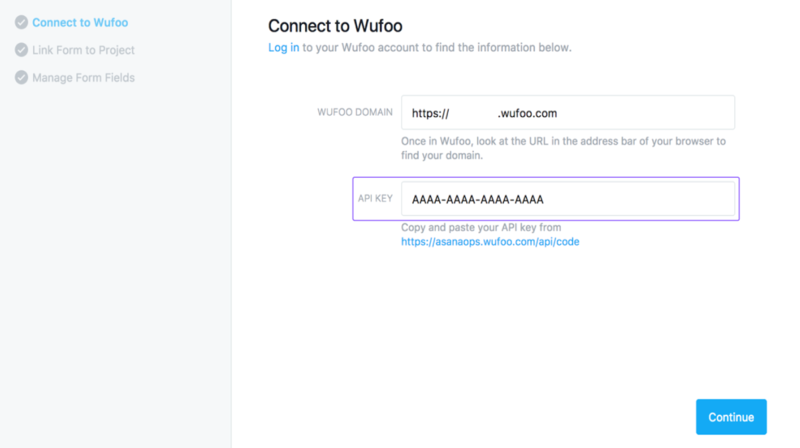 Copy and paste it from the URL into the Domain/Username field, and a link will appear under the second box to take you to your Wufoo API key. Continue through to Wufoo and copy your API key from this page. 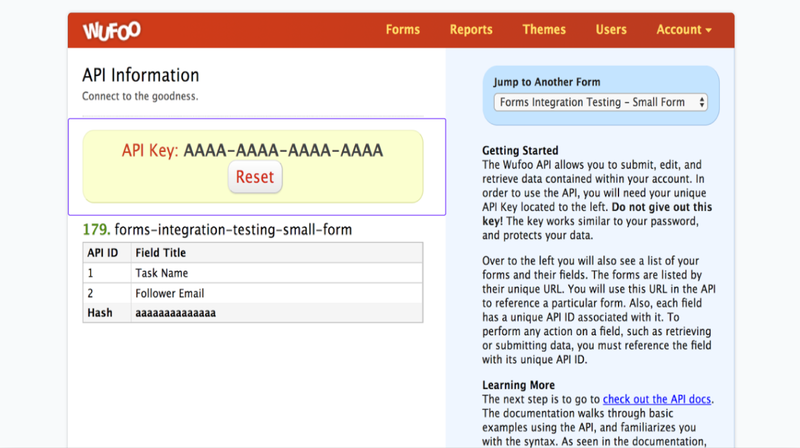 Paste this API key back in the second field on the integration page. In the Form dropdown field, all available forms will be displayed. Select the form you would like to link. In the Project field, search for the Asana project where you would like form submissions to appear. Use the Manage Form Fields on the left to choose the task name and set additional options. Here, select which form field should be translated to the task name in Asana. 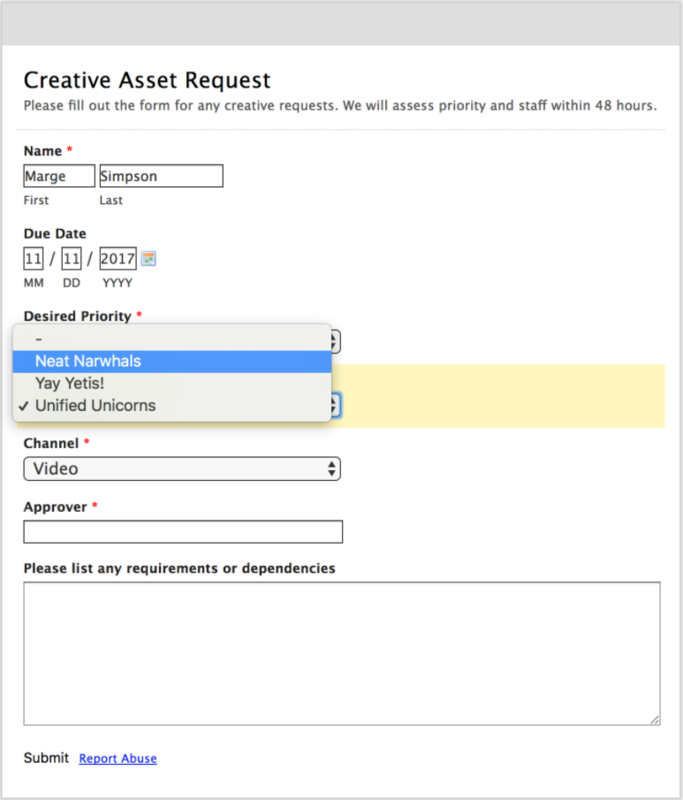 In the second field Due date, you can choose a field that, when filled out, will be set as the task’s due date. This must be a Date field in your Wufoo form. If the field is left blank, the task will not have a due date. 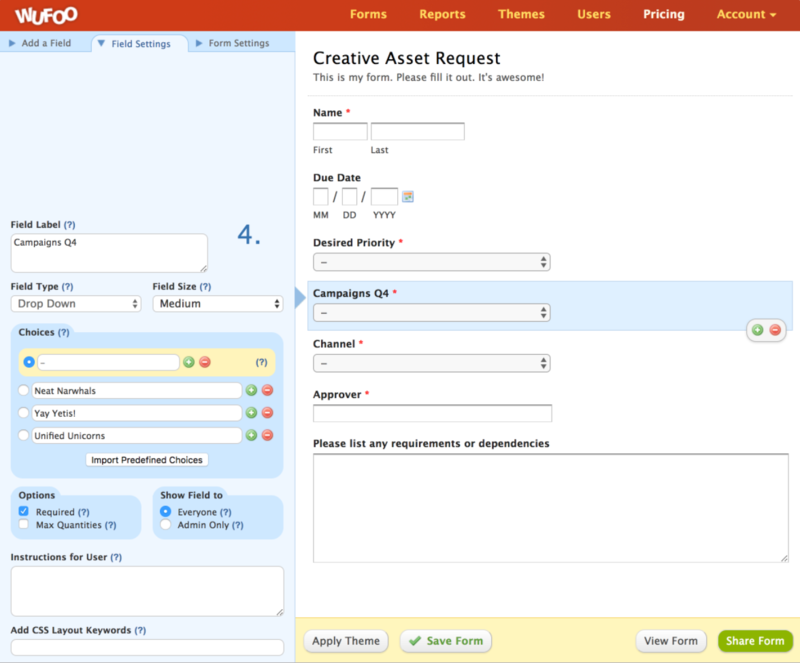 Similarly, the third-drop field allows you to set an assignee on the task. The corresponding field in your form must be an Email field. The fourth field allows you to add a follower to the task. This can also only be tied to an Email field in Wufoo. If the field is left blank, no follower will be added. By default, if the person is not already part of the Organization, they will not be added as a follower. Text custom fields can be mapped to any Single Line Text or Paragraph Text field in Wufoo. Number custom fields can be mapped to any Number, Price, or Date field in Wufoo. Choice custom fields can be mapped to any Multiple Choice or Dropdown field in Wufoo. The choices in your Wufoo form must correspond exactly with the names of the choices in your custom field. The next section shows all the form fields that will appear in the task description. This cannot be edited, all form fields will be included in the description. If any field is left blank in a submission, the title of the field will still appear in the description, but without any value beneath it. Wufoo allows you to attach files to the form submissions, and the integration can optionally import these files and add them as attachments on the task in Asana. This link to download the file will always appear in the task description. If you specify an email field to add as a follower, you can request that the follower be invited to the Organization if they are not already part of it. In this case, the email address entered in the chosen field will receive an invitation to Asana when the integration processes the submission, but only if the email address’s domain matches your Organization’s domain. They will then join your Organization as a member. The Asana Wufoo integration uses Wufoo webhooks to expedite task creation. As of November 2017, webhook support became part of Wufoo premium pricing so if you are not in a premium Wufoo account, you may experience a delay in task creation.